I rarely dance and have rarely seen people actually dance here in northern Ontario, even in nightlife or weddings. The one time I had the confidence to dance, I was in a club on ecstasy. And I sucked. It's just not a big thing in Canada and the USA, I guess. At least comparatively. Uh, go to a big city, then pick any one of hundreds or even thousands of clubs across those cities and then tell me it's not big...It is pretty big in the big cities. A lot of people do it. The US doesn't have a clubbing/dance music culture comparable to Europe or Latin America, for some reason. Um, yes it does in certain parts, it's just not on a big scale like Europe or Latin America. But it definitely exists here and that music is becoming bigger and bigger. Most clubs play EDM and most of the **** is from Europe. Again go to NYC or Chicago and you'll see a big electronic act playing at least once a weekend. Yeah sure you aren't going to find it in the middle of Ohio in a city of 40,000 people, but the bigger/big cities? Yes you absolutely will find it. House music was ****ing invented in Chicago for god's sake. ^ Yes i know but it doesn't seem intrinsic to American culture like it does in the Latin cultures for some reason. American music seemed more dominated by rock and hip hop while dance/euro-pop/trance/techno were huge in Europe. House and stuff had their time in the scenes of LA, Chicago, NY, SF, but these are the largest cities. It's no surprise Miami is seen as the clubbing mecca in the States, it's more of a Latin city than an American city. If you really don't think electronica/dancing is that popular in the US, especially amongst people 16-30ish years old, then you have a lot to learn. A lot of people could care less about "Americana" here. Many do, many don't. Just because you are in a small town doesn't necessarily mean you're automatically like "'MERICA!" too. American music is dominated by pop, hip-hop, and rock but even the pop and hip-hop has elements of electronica. Many commercials on TV use electronica now too. Some 15 years later, in 2011, Spin magazine reported that the American dance music scene had finally reached critical mass with a "new rave generation" of mainstream consumers having emerged. Both domestic and foreign artists no longer viewed America as the "final frontier" when it came to EDM and the market was now wide open. Today it has become common for established Top 40 artists and producers to infuse elements of popular EDM styles in their music. According to Time Out Chicago, EDM has "become the driving beat behind pop music and product sales, the soundtrack of choice for a new generation." You know what Lollapalooza is? It's a big rock festival that's been going since the early 90s. Yes, it's mostly rock/alternative rock/punk. So, if electronica isn't terribly popular, tell me why at a rock festival, an entire EDM section was added that attracts thousands now? Tell me why Deadmau5 headlined in 2011 and drew more of a crowd than the Foo Fighters (even after a torrential downpour)? 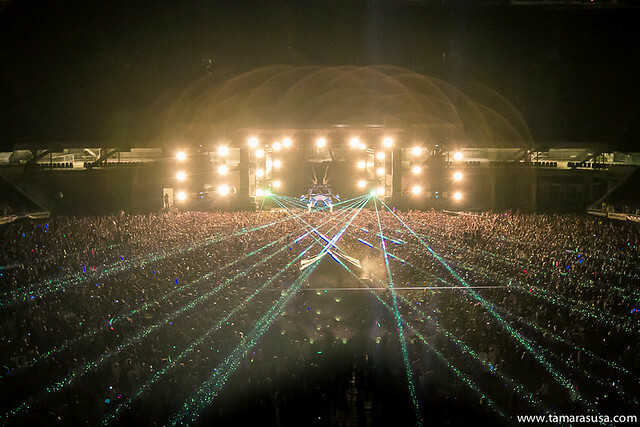 Here's an electronic music festival in Chicago also this last summer at Soldier's Field, which is a large NFL stadium. No, these aren't just a bunch of people from Chicago. How about Northcoast Music Festival? How about an electronic festival, Wavefront Music Festival, on a beach on the north side that was barely even advertised? Last edited by MissionIMPOSSIBRU; 01-12-2013 at 04:51 AM.. Some people are so clueless when it comes to this **** it's pretty funny. If you want to see examples of this in America, look above to my post with a bunch of pictures. You are about 20 years behind the times. They do get stuff wrong in this article about certain aspects of electronica itself, but they do get the main point right that the music has taken off in the US.